Perfect for pool, patio, inside and outside, our everywhere glasses have such clarity, you might mistake them for crystal. But they're not. They're actually made from food-safe, shatter-resistant Eastman Tritan™ copolyester (BPA-free/FDA-approved) that won't crack or break, making them ideal for entertaining anywhere without a worry. 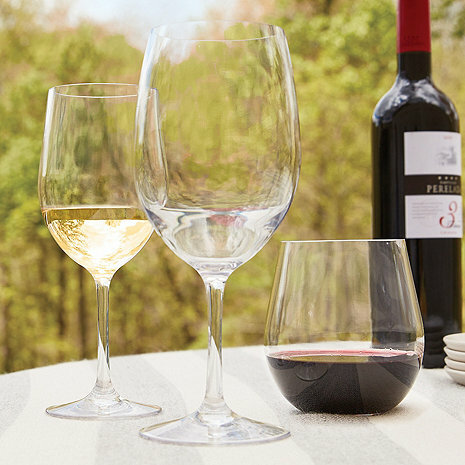 Styled to reflect the wine's color, our Indoor/Outdoor glasses are designed to enhance its aroma too. Dishwasher safe (but note, they must be put on the top rack only and are not suitable for a heated cycle). Are they made of glass? BEST ANSWER: Nope they are plastic. We bought them for our pool area. They look great. Dishwasher nicely and feel good in the hand. Better then other sets... we got two sets to replace all our outside glasses. The Indoor Outdoor Wine Glass Party Pack (Set of 12) are made from shatter-resistant Eastman Tritan™ copolyester (BPA-free/FDA-approved) and they are dishwasher safe. No they are not. They are shatter resistant and great for entertaining outdoors. No. They are plastic. They are very clear...and look like glass. No. A plastic type material that seems to hold up in the dw. No, they're made of a high quality plastic. I am from India, how can I purchase this product? I was pleased with the quality. I gave them as a gift and the gifted was also pleased. Like the fact they don't change the taste of the wine. Also like that they are upper rack dishwasher safe. Our friends don't immediately notice the change to plastic in our pool area. The glasses are thin, lightweight, and clear. Very close in feel on your lips to fine wine stemware. We love these glasses. They are so much like glass but almost indestructible! The plastic glasses we’ve had in the past were thick, scratched easily and weren’t dishwasher safe. Perfect for entertaining outdoors. We love these glasses. Great quality! Perfect for our pool parties. At first I thought hey might be too light for outdoors but they wee perfect once the glasses had wine in them. So glad I have both white & red. It was nice not to have the small glasses that some of the wineries have. Beautiful indoor outdoor wine glasses! Love the Indoor Outdoor Wine Glass Party Pack set of 12. I love these glasses! They look like real glass, but are made from the shatter-resistant material so I can drink without worrying if my dog knocks off my glass from the outdoor (or indoor) table! Beautiful too! The set allows one to use them either indoors or outdoors. Good quality at a reasonable price that offers real flexibility for both indoor and outdoor events. We thought they would not have a seam on them, but they do, we saw them at friends n no seam on theirs. Not as pleased but will keep! Not as nice of a quality as I was hoping for the price. The seam lines on the plastic were distinct. I have seen and was hoping for more quality for the price. I will keep and use these by the pool but I won’t proudly serve outbof them. Perfect for a lake house. Dishwasher friendly is a plus.